Check out pages 8-11 in our brochure for current youth instructional swim class information. Swim lessons can save a life, build a child’s confidence, and introduce little ones to a lifelong habit of water exercise. Our carefully selected instructors are certified American Red Cross (ARC) Water Safety Instructors. Our curriculum is expertly planned using the water safety guidelines outlined by the American Red Cross. 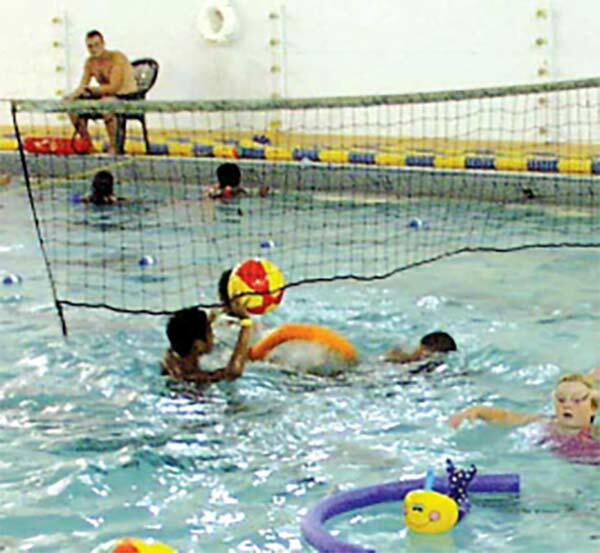 Whether your child is fearful of the water or just wants to perfect a particular stroke, we have a right class for you! Our highest priority is to provide all swim lesson participants with a safe and comfortable place to learn swimming skills that are appropriate for their needs and abilities. Upon registration, we will ask that you choose the lesson level that best fits your child. The suggested ages listed are merely designed to serve as a guide but should not be the main determinant in selecting a class for your child. Registration deadline is the day prior to the start of class. Please plan accordingly to ensure timely registration. The LIFE Community Center is open until 7:00pm Monday – Thursday & until 9:00pm on Friday. No late registration. If group lessons are not your thing, or you need flexible scheduling, consider private or semi-private swimming lessons. Private lessons match one student with an instructor. Semiprivate lessons match two students of similar ability with one instructor. Lessons are available at the Julee Illner Memorial Pool during our regular pool hours when an instructor is available. Lessons at the Super Splash Park are available Monday through Friday between 8:00 and 10:00 am. Lessons are 30 minutes and should be scheduled in increments of four. Private lesson payment is required when the appointment is made. Call 549-4222 or stop in at the LIFE Community Center to schedule your lesson. Parent Tot Exploration 9Month - 3Year A parent or other adult caregiver is required to accompany each child in the water Experience buoyancy, floating, arm movement, entering / exiting the water, submerging face, and kicking. Sing songs and play in the water. Parents are taught to help children learn and practice skills. Preschool 3-4 Years None. This is the first class without Mom or Dad. The objective of this class is to help children feel comfortable in the water and enjoy the water safely. Develop confidence in the water while learning fundamental skills such as submerging face, bobbing, jumping into the water, front & back floats, front crawl arms (20 ft.), front & back glides (10 ft.). Beginner 5-7 Years None. The class will practice similar skills to the preschool class but will be encouraged to do more on their own and unassisted. Blowing bubbles, jumping in chest deep water, staying submerged for 5 seconds, swimming back to side of pool, unassisted back and front floats for 10 seconds, unassisted front and back glides, front crawl arms 20 ft., front crawl for 25 yards, backstroke for 25 yards. Advanced Beginner 6–8 Years Graduate from Beginner or can demonstrate all of the completion requirements of the Beginner level class. The Advanced Beginner class will build upon skills from the Beginner class but will be pushed to swim longer distances and refine their skills with more independence. Blowing bubbles, consecutive bobs, jump in chest deep water and swim back to the side of pool, unassisted front and back floats for 10 seconds, front crawl with rhythmic breathing for 25 yards, introduction breaststroke. Intermediate 7–9 Years Graduate from Advanced Beginner or can demonstrate all of the completion requirements of the Advanced Beginner level class. Will work on increasing their distance, stroke refinement of previously taught strokes, and will be introduced to more strokes. Front crawl for 50 yards using rhythmic breathing, backstroke 50 yards, breaststroke for 25 yards, introduction to sidestroke, elementary backstroke for 75 yards, introduction to dolphin kick & butterfly arms, butterfly for 25 yards, tread water for 2 minutes. So IL. Autism Society Swim 3 Years+ None. This is a partnership program between the CPKD and the Autism Society of Southern Illinois designed to help children with autism feel comfortable in the water and enjoy the water safely. Swimmerships available through the So. IL Autism Society. Contact stepahnie@autismillinois.org. Every child with Autism Spectrum Disorder learns differently and our instructors understand that. This program is designed to help the individual needs of every child by pairing them with their own instructor and learning the fundamentals of swimming. Skills taught in this program include entering and exiting the pool safely, kicking, paddling, and rhythmic breathing.